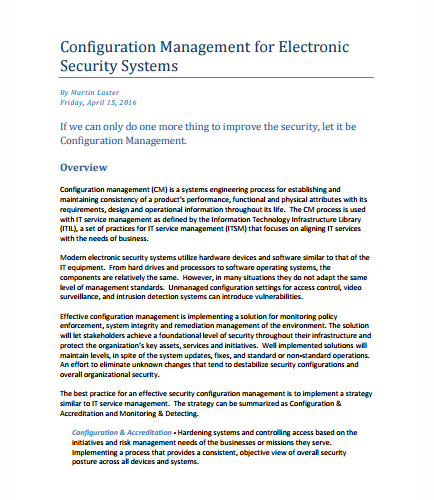 "Configuration Management Plan for Electronic Security Systems"
Configuration management for IT environments and electronic security systems are implemented within an organization to fully realize the benefits and maximize the security effectiveness. Locking down and properly configuring security parameters on servers, workstations and network infrastructure platforms has long been a mainstay of best practices in information security. How can you establish and maintain consistency of a product's performance, functional and physical attributes with its requirements, design and operational information throughout its life, without missing errors that lead to failures? Information Sharing with SOPHIA has become an important aspect for organizations to improve the protection of their systems, process, or people based on the regional threat. By integrating SOPHIA's information sharing processes, it becomes easy for firms to share information on related risk profiles using modular functions. If you want to improve the protection of systems and processes within your organization then download this whitepaper which covers the listed points: Benefits of integrating SOPHIA's information sharing processes The goal of using the SOPHIA framework Services offered by SOPHIA for information sharing Improving the overall physical and cyber security information sharing Accentuate the need for collaborative information sharing This white paper refers to the day to day users of SOPHIA’s services and victims that suffer from any part of the cascading effects of a physical or cyber-security attack on a sector. Multi-Factor Authentication (MFA), is a very secure method for providing access to systems and data because it requires a second authentication factor. A large number of organizations use Multi-Factor Authentication to provide extra security for company critical data. Azure MFA can help to protect access to data and applications and meets user requirements for a simple login procedure without the necessity for additional hardware tokens. This white paper provides an insight into Multi-factor Authentication which covers: Why do we need multi-factor authentication? How does Azure MFA work? How to enhance security with multi-factor authentication? How does it provide uniform functionality to its end users? How can you successfully implement Azure Multi Factor Authentication? The process of converting raw materials in to well finished goods that can meet consumer’s expectation is known as Manufacturing. Manufacturing is a process where goods are produced in bulk quantities to meet customer’s requirement. Basically manufacturing is an engineering function where raw materials are converted into products that can be used for some particular purpose. What is Digital Supply Chain ?